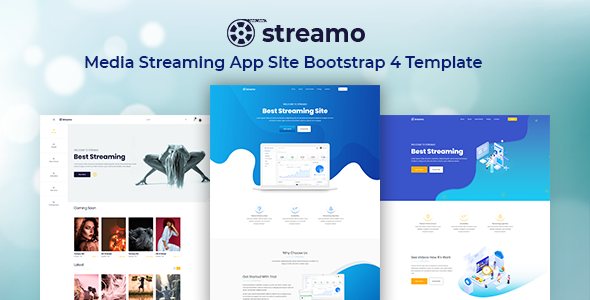 Streamo – Media Streaming App Site Bootstrap 4 Template is a mind-blowing design of HTML template. Streamo HTML template is to set up websites for Media Streaming App. However, Streamo Bootstrap4 template comes with 9+ Home Landing Pages and 5 other HTML pages for bringing variation. This impressive website has been powered with Bootstrap4, HTML5 & CSS3. This SASS supported template has tons of useful features. Streamo has used Slick Slider, Google Font, W3 Validate Markup, Well Documentation, Working Contact Form, Material Icon Used and many more. In addition, Streamo has Responsive Layouts and Cross-Browser compatibility. No interruption occurs on the basis of device and browser variation. To operate Media Streaming, this HTML template has been equipped with all the relevant tools & aspects. Above all, the catchy design will surely attract people indeed. Do not falter to get such a beautiful template.